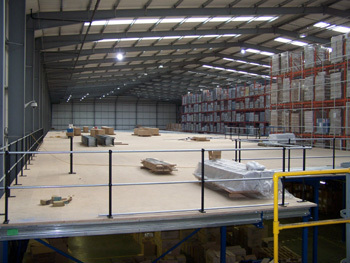 Jigfloor mezzanine floors are designed in house to suit your requirements. The mezzanine floor is GUARANTEED AGAINST DEFECTS AND COMPONENT FAILURE FOR TEN YEARS from installation date - obviously this excludes normal wear and tear and abuse/ misuse, but we think that peace of mind should be provided FREE OF CHARGE. Typically, your bespoke mezzanine floor will be designed to suit your very particular dimensions and available space in order that you can put the under utilised parts of your existing or new premises to good use at a fraction of the cost associated with procuring new buildings. Any size or shape of free space can be enhanced with the addition of a new Jigfloor mezzanine floor - all you need to do is identify where you think that one of our structures can be put to good use and then let us do the rest - from design through to installation and final approval by your Local Authority or Approved Inspector, Jigfloor will assist you in making the very best, most cost effective use of your free space with a speedy, professional and courteous service. We do not provide the entire "one stop shop" solution at Jigfloor - we employ no representatives or personnel whose experience lies outside of our core products, however we can bring in M&E partners, Civil Works Contractors and other services should you wish, enabling you to retain Jigfloor as your single point of contact and thus avoiding the need for multiple orders and numerous discussions between disparate bodies, where a single call will suffice!